It's my hand and I'll type what I want..
You would write too if it happened to you.. Anyway, I started reading the book I mentioned yesterday, Super Trader, by Van Tharp and so far it seems pretty interesting. 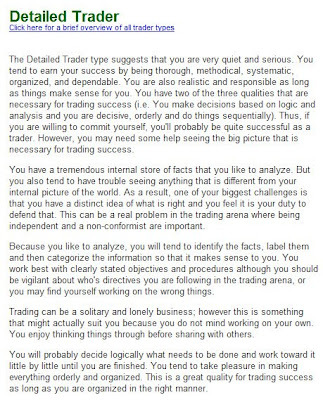 He says that a person must know what his or her trading style is in order to be effective and for that, he has devised an online test that you can take by clicking here if you so desire (I guess that is sort of like all those tests people post on Facebook like which Beatle are you, or what fungus do you most resemble, etc. except that this one is supposed to be serious. Go ahead and take it - it doesn't take long and at the end when it asks you for your name and e-mail address before showing you the results, just type in fake information if you want because it doesn't know the difference and after you do, it takes you to the results page. I thought the description was pretty accurate. I wish that automatically made me like my buddy Warren, though. 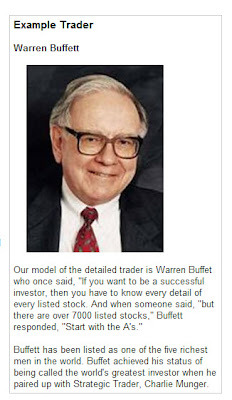 There were a couple of questions that I wasn't sure how to answer so I went back and retook the test, answering it the other way for the two or three that were not definite, but I got the same results as before (hmm.. maybe everyone is a Detailed Trader.. the guy makes us all think we are like Warren Buffet in order to get us to buy his book, haha.. too late, I already did). Regardless, the book is interesting so I look forward to doing more reading.